Late in the evening on the 7th of January the Mother of God arrived in Barcelona, the capital of Catalonia, the second largest city in Spain. The Częstochowa Icon was welcomed and carried into Iglesia Medalla Milagrosa (the church of the Miraculous Medal). She was awaited there by a group of Poles with the local pastor, fr Xavier Pages. The prayers lasted till late at night. 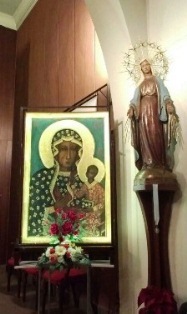 It is worth mentioning that Poles in Barcelona have their own little Chapel of Our Lady of Częstochowa, the Queen of Poland, at the parish of St Felix the African, where there is a copy of the Częstochowa Icon blessed by the Holy Father John Paul II on the 7th of November 1982 during his visit to Barcelona. On the 11th of November 2012 the Poles celebrated the 30th anniversary of the image blessing. All the following day, the 8th of January, the Częstochowa Icon stayed in the church of the Miraculous Medal in Barcelona. At this parish there is CIDEVIDA – the Interenational Pro-Life Centre, second biggest in Spain. That is why this church had been selected as a stop in the peregrination of Our Lady in Częstochowa Icon for the defence of life from Vladivostock to Fatima. At 8AM adoration started. The Icon of Our Lady of Częstochowa was placed at the main altar untill 10.30 AM. Next it was carried in a procession to the side chapel of the Most Blessed Sacrament. At 11AM the Holy Eucharist was celebrated there. It was presided over by Fr. Xavier Pages. During the homily he spoke about the necessity to defend the civilisation of life. He also encouraged the people to visit the pro-life museum which is housed at the centre of CIDEVIDA at the local parish. After the Holy Mass there was individual adoration, and in the Hour of Mercy, at 3PM a group of Poles said the Chaplet to the Divine Mercy. The Holy Rosary for the defence of life and family was said at 6.30PM and after that another Holy Eucharist was celebrated. Late in the evening the Icon was solemnly carried to the church of St Teresa of the Child Jesus. On the next day in Barcelona, January 9, the Icon was in the parish of St Teresa of Child Jesus. The first Holy Mass was celebrated at 7.30 AM. Next there was individual adoration. The second Holy Mass was celebrated at 10.PM. At the end of the day the Pastor presided over the Holy Mass at 8 PM. During his homily he spoke on the defence of life, stressing the responsibility of politicians for the legislation protecting life.